The national food media has been giving little Portland, ME, a lot of attention lately, and for good reason! First, Bon Appetit’s October issue named Portland this year’s “Foodiest Small Town in America.” And yesterday, the New York Times ran a long, photo-laden piece starting on the front page of the Dining & Wine section called “In Portland’s Restaurants, A Down East Banquet” that focuses on the collective nature of the burgeoning food scene here. As many of you already know, I was the lucky photographer who took the images for this article. I spent two days with the reporter, Julia Moskin, visiting restaurants, markets and shops. We had a jam-packed schedule that usually allowed for about 30 minutes in each locale. This was an excellent test of my ability to get high-quality images in a short time period while working with available props and light. I sent in dozens of images and while the Times managed to run a large number (15 in the online slideshow, another 5 embedded in the online story, and 12 in the print version), there are, of course, some other images I really like that weren’t included. I thought I’d share some of those with you here. Hope you enjoy them! 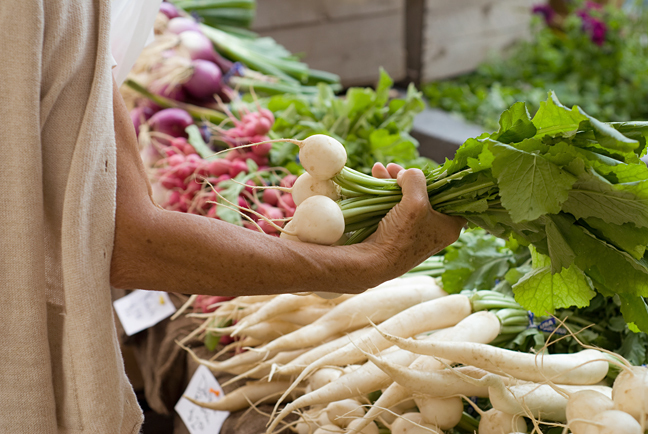 Selecting a bunch of turnips from Freedom Farm’s stand at the Portland Farmers’ Market. 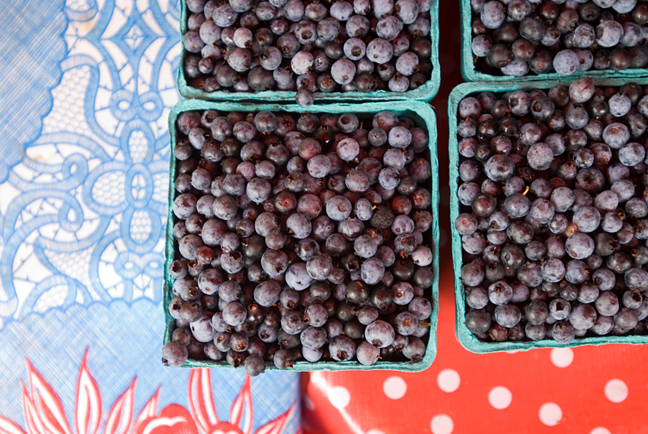 Wild Maine blueberries from Beth’s Farm Market for sale by Wealden Farm in the parking lot of Rosemont Bakery & Market. 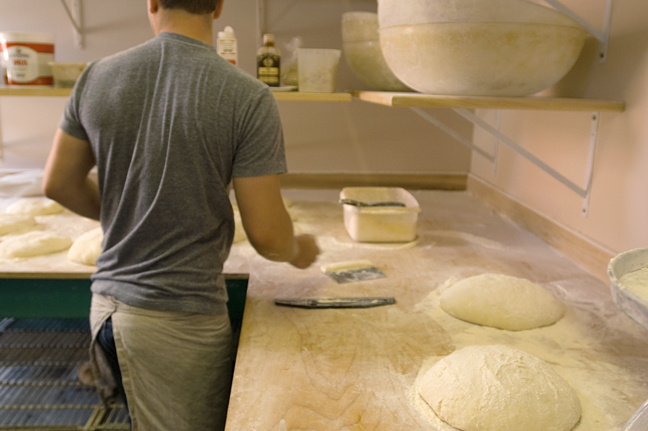 Brian Pramick working in the bread baking area at Micucci Grocery. 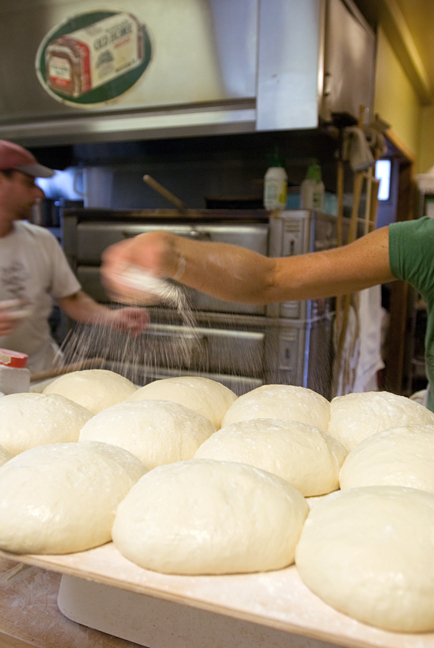 Allison Reid, co-owner and baker at Scratch Baking Company, sprinkling flour on dough that will be shaped into baguettes. Bagels at Scratch ready for the oven (foreground) and to be boiled (background). 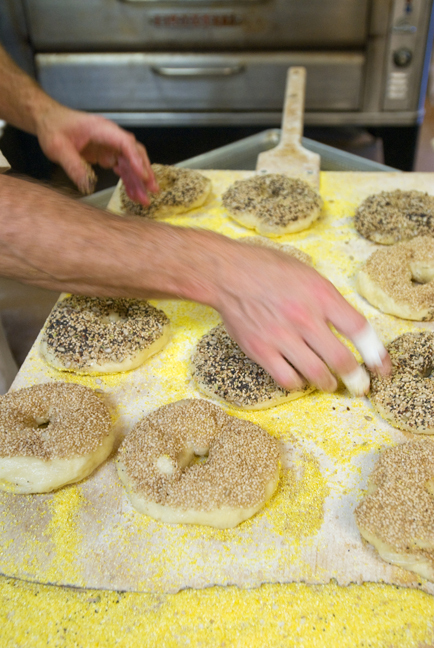 Lou Slingerland puts seeds on Scratch’s highly sought after bagels. 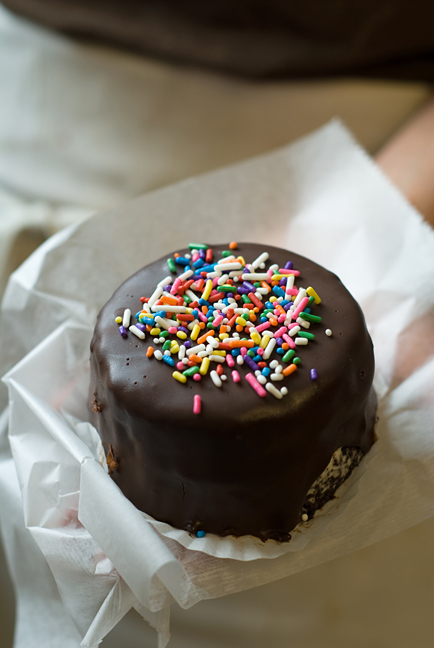 The Ring Ding a Ling, Scratch’s creative alternative to the traditional Maine whoopie pie. 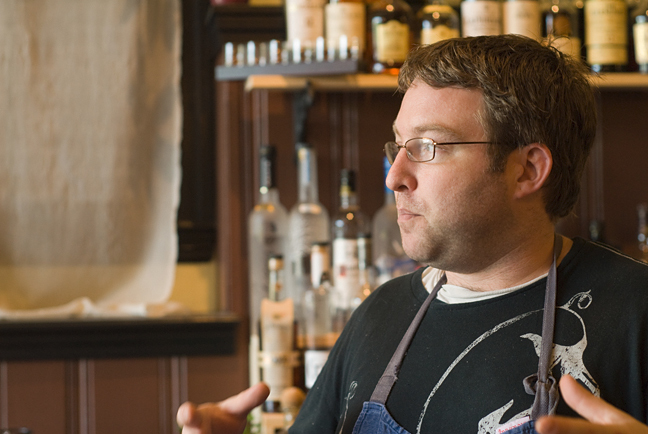 Erik Desjarlais, chef and owner of Evangeline. 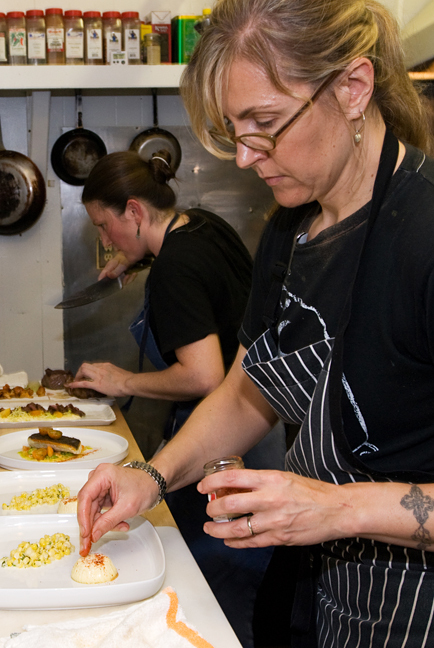 Krista Kern Desjarlais, the owner of and chef at Bresca, with sous chef Courtney Loreg (watch out, she wields a mean knife!). 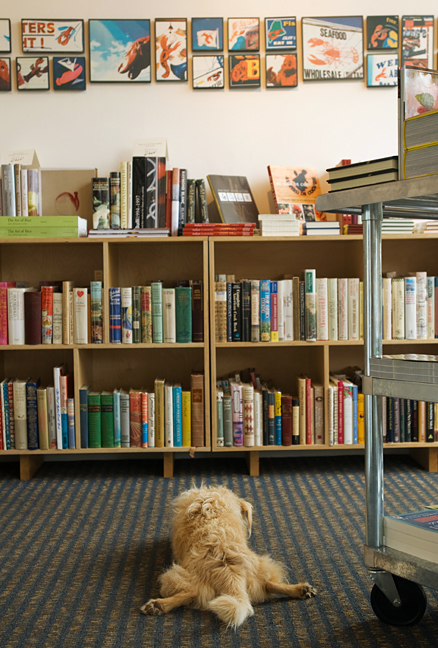 Last but certainly not least, Raleigh, very possibly the best dog ever (sorry, Clara), at Rabelais, a cookbook store devoted to new, used and rare books on food, beverages and gardening. 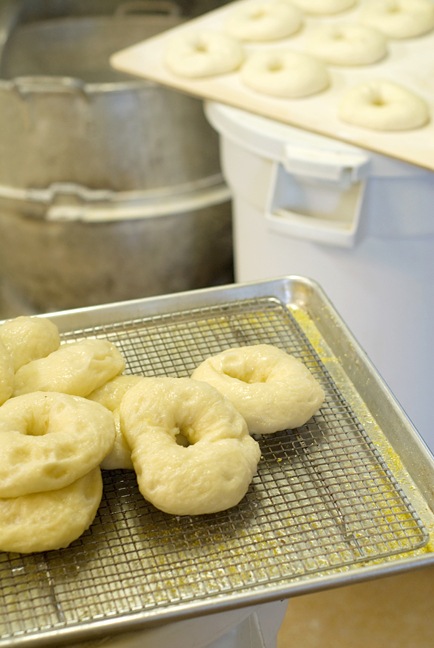 This entry was posted in food, The New York Times and tagged bagels, Erik Desjarlais, farmers' market, food photography, Krista Desjarlais, Maine, Micucci's, Portland, Scratch Baking Company, wild blueberries on September 17, 2009 by Stacey Cramp. Oooh, thanks for sharing more. Love these! I especially love the blueberries. Also, now I want a bagel. Glad you like. I know, it was nice of the Wealden Farm folks to use those lovely oilcloths on their tables! Thanks, Sally! You’re always welcome. In the meantime, the image of you that will stick in my head is when I looked out the door and saw you in our car totally engrossed in a bag packed full of goodies from the bakery! I think maybe there was some drool involved too (just kidding! ).